Icidivit is manufactured as emulsion for injections. 1 ml contains ASD-2F - 0.04 g, vitamin A - 15,000 units of activity, vitamin E - 10 mg and amber acid - 0.05 g.
It is a combined immunostimulating drug. 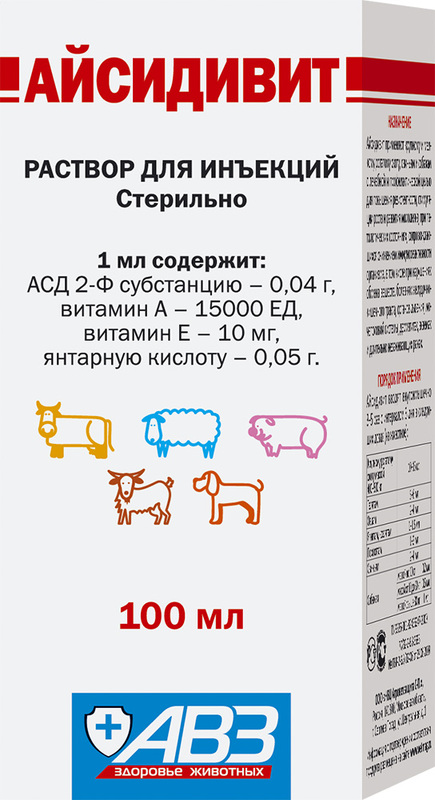 Use Icidivit in order to increase natural resistance, promotion of growers growth and development; in pathologic conditions associated with immune reactivity reduction including treatment and prevention of metabolic disorders, diseases of gastrointestinal tract, respiratory and urogenital systems, dermatitis, eczemas, sluggish wounds in cattle, small ruminants, pigs and dogs; in weakened animals and those with history of previous infectious and invasion diseases; in order to increase animal productivity. Do not use in case of increased individual sensitivity to the drug components (including such a medical history). • Stimulation and normalization of sexual function in infertile cows with hypo-ovarionism: administer 10-15 ml per animal 30, 25 and 20 days before insemination. • In order to increase breeding efficiency, prevent embryonic mortality and reduce service period, administer 10-15 ml per animal on the insemination day, 5th and 10th days after insemination. • In order to prevent puerperal complications, endometritis, retained placenta and fetal hypoxia, administer 10-15 ml per animal for 4 times (10 days apart) within interlactation period. • In order to repair ovulation in cows, administer 8-10 ml per animal on the 5th, 10th and 15th days after delivery. • In order to increase embryonic viability in pregnant sows, administer 3 ml per animal on the 7th and 12th days after insemination. • In order to prevent fetal hypoxia in sows, administer 5 ml per animal on the 45th, 70th and 85th days of pregnancy. Adverse events are not generally observed. In case of allergic reactions, stop drug administration and use antihistaminic drugs. Store at 0-25°С. Protect from light. Shelf life is 2 years from manufacturing date and up to 30 days after stopper perforation.